Federal and state teams arrest people at gunpoint, destroy food, and seize assets—all because they’re afraid of unpasteurized milk and cheese. Please don’t let them trample the Constitution this way—a new Action Alert! On August 2, there was an armed raid on Rawesome Foods in Venice, California, conducted jointly by the Los Angeles County Sheriff’s Office, the FDA, the Department of Agriculture, and the Centers for Disease Control and Prevention. You may recall that we reported about a similar FDA raid on the same co-op last year. Mike Adams, editor of NaturalNews.com, broke the story last week, and we thank him for his excellent and continuing coverage of this issue. He reports that armed teams were deployed with guns drawn, law enforcement ordered all co-op members out of the store, seized all the cash in the register, then handcuffed the co-op’s founder, James Stewart, and placed him in an unmarked car without reading him hist rights. Then authorities seized $70,000 in raw organic food—raw milk, cheese, yogurt, and fresh produce—and poured an estimated 800 gallons of milk down the drain, though there was no evidence that any of the products were contaminated. Two others were arrested as well: Sharon Palmer, owner of Healthy Family Farms, and Victoria Bloch, the LA County liaison for the Weston A. Price Foundation. They were charged with the production and sale of unpasteurized goat milk, goat cheese, and other products without the proper permit; and with “mislabeling cheese.” They were also charged with four counts of conspiracy to commit a crime. Unpasteurized dairy products are legal in California, but the Los Angeles District Attorney says that applicable licenses and permits are required. This is a specious claim. As Mike Adams points out, Rawesome does not need a license because it is not a public store, but rather a private club or co-op whose members actually own a percentage of the cows, goats, and farms that produce the raw dairy. The state of California is trying to regulate it as a public grocery store, when it is instead a private buyers’ club. The facility is used only as a distribution point for the products that the members already own. All three of those arrested have been released from jail after posting bail, but only on condition that they give up their First Amendment rights and refrain from talking to anyone about the case—specifically, from communicating in any way, verbally or nonverbally, about the government raids conducted against them. The public has responded with outrage. A public protest was held in front of the LA County Courthouse; this, together with the global attention the raid has caused, may have been responsible for the swift reduction in James Stewart’s bail—from $123,000 down to $30,000. “Plaintiffs’ assertion of a new ‘fundamental right’ to produce, obtain, and consume unpasteurized milk lacks any support in law. However, the US Constitution restricts the government from infringing on the rights of the people—so controlling what people eat, even through legislation, is an overreach of government power. In addition, it can be argued that health freedom—and the right to eat what we wish—is embedded in the ideas of privacy and personal autonomy protected by the 14th Amendment. FDA justifies its actions from a food safety perspective. But virtually any food can contain harmful pathogens. In fact, you are 35,000 times more likely to get sick from other (FDA-protected) foods than you are from raw milk. 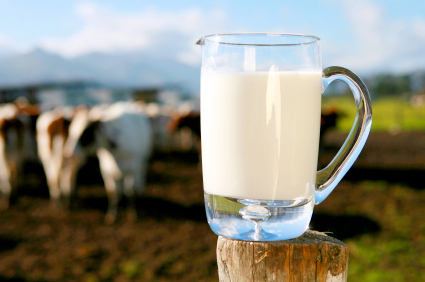 Raw milk has been conclusively shown to be both safe and healthy. The truth is, the FDA and other federal agencies are being motivated by the interests of Big Food—and in this case, the interests of the dairy industry. Once again, we see crony capitalism at work. The USDA has an entire marketing arm called Diary Management that actively pushes the sale of pasteurized cheese and milk. This is merely the latest skirmish in the FDA’s long war against raw milk producers and small business owners. ANH-USA is working on a legislative approach that will buttress a right to health freedom, but for now, please read our new Action Alert. Congressman Ron Paul’s HR 1830 would authorize the interstate traffic of unpasteurized milk and milk products packaged for direct human consumption. Please contact your representative and senators today!